Praise God for the victory we have in Jesus. Throughout all these process of doing and obeying God´s will for our lives, never has He failed and had made any mistake of leading and guiding us towards the right direction. We thank God for wisdom, strength and favour. Thus far has the Lord helped us . Amen! be a blessing to this nation where the Lord brought them. Please pray for the Spanish & Latin group slowly integrating during our Monday cell group meetings. Miracles have been taking place, healing, work provisions, relationships restored and the most important is that souls are getting saved. Amen. 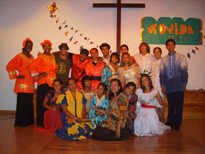 During the MOVIDA FESTIVAL last July 26 - Aug 04 we had about 30 participants representing the four Spanish & three Filipino Churches. By faith the campaign took place in Puerto Banus as our central base doing ministries at the surrounding areas such as San Pedro & Marbella. Our ‘Manna’ for every single day was provided by various people & we never had missed a meal. Accommodation for Sonja with her team (Rene & Tashika from Dallas, Texas) & Lorelie from Madrid was provided by a young Dutch couple. While Rey & Dani stayed with a Filipino family. Doing missions by faith makes life´s adventure much more exciting and God´s faithfulness is always proven new every morning, Great is His loving kindness and mercy, Amen! During this past, several weeks I have been able to experience the move of God; the move of His Spirit in a place in Spain where not many people would expect it to happen. ART Company (Ministry of Creative Arts) went to Malaga, Marbella (Puerto Banus) to perform various festivals called MOVIDA Festival in order to reach out and evangelize in the luxurious streets of Puerto Banus. Due to the fact that this place is a mostly tourist and rich society province; money, fame and pleasure form a serious role. Nevertheless, through Christ, we were able to impact and make the difference out in the streets performing especially during the night where the night-life people always begin to crawl out of the darkness into a deeper darkness. Serving as living sacrifices was not in vain. We all felt the light shinning through the darkness. From Monday to Friday we would spend devotional time with the youth, maturing and learning to build each other up together in order to be ready for any attack. Also, every weekend we began to see results. 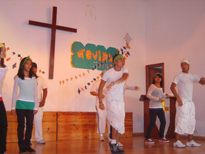 People from the streets together with families, and even some family members from the youth that helped us, accepted Christ Jesus into their lives, creating for them a new way of living the restless nights into new days. Truly it´s been a blessing to give and harvest new souls for Christ. I believe that the privilege that He has given to me to share and witness this experience is and will never be enough. Just like apostle Paul, I would’ve loved to stay some more with them. With the churches of Malaga, with the Youth and the beach and the swimming pools and the ice-creams and the big houses and the flamencos, Gitanos and Moros (moros are people from Marruecos) but I also know that when we learn to decrease for Him to increase, the satisfaction and purpose in your life has so much joy it´s hard to explain with words! THANK YOU SO MUCH FOR ALL YOUR SUPPORT AND PRAYERS TO US.